Inertia Films founder Troy Thomas has been using Cartoni tripods for 25 years. In fact, he has been using the same Cartoni Delta tripod since 1994. That tripod, along with newer Cartoni models, will support Inertia Films as it covers Super Bowl LIII in Atlanta. This will be Atlanta’s third time hosting the Super Bowl but the first to be played at Mercedes-Benz Stadium, home of the Atlanta Falcons. Inertia Films founder Troy Thomas will once again rely on Cartoni tripods for the Super Bowl. Founded in 1993, Inertia Films is an Atlanta-based video-production company. What started out as a single camera operator has grown steadily to provide services that include field and studio production, postproduction, live-shot capabilities, and equipment rentals. The state of Georgia has seen a record number of productions because of tax-incentive legislation. According to the Atlanta Journal-Constitution, Georgia had 455 qualified TV and film productions in fiscal year 2018, by far the most since the tax credits were passed in 2008. Inertia Films has managed to carve out work on these productions in large part because of its in-house experience and hustle. Along the way, Inertia Films has made a name in the Atlanta production business with its versatility, working for corporate clients, cable news networks, and broadcast programs like American Idol, NFL Total Access, Auction Kings, Gangland, House Hunters, PBS NewsHour, and Inside the PGA TOUR, to name a few. Being diversified also means being able to shoot for newsmagazine shows on cameras like the Sony FS7 or Canon C300 or to switch to a more cinematic style with its Arri Amira camera package. What began on a dining-room table in Cincinnati in 1993 now has credits in 38 states, 13 countries, and four continents with more than 150 awards, including four regional Emmy Awards. Inertia Films’ latest Emmy was for PBS documentary Liberty & Slavery: The Paradox of America’s Founding Fathers. Late this month, Inertia Films will prepare for its latest production challenge: Super Bowl LIII in Atlanta. The NFL Championship provides more than two weeks of work with more than 40 camera crews booked just to cover Super Bowl Week. Additional crews will be needed for entertainment magazine shows, live shots, and various corporate clients that will descend on Atlanta. 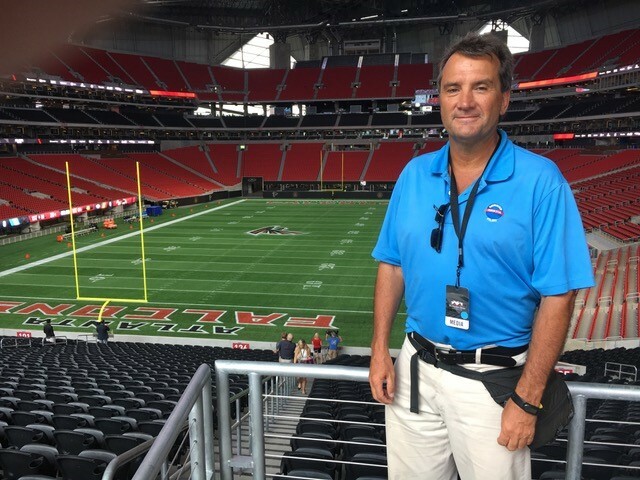 Thomas worked at previous Super Bowls in Tampa, New Orleans, and Atlanta, but he says this year’s game is by far the biggest sports challenge his crews have faced so far. He notes that the Cartoni Delta is lightweight but heavy enough to support the various cameras he has deployed over the years. The Cartoni Delta tripod system was originally manufactured in the early ’90s to support EFP camcorders equipped with large lenses or to be deployed with EFP cameras. Cartoni replaced the Delta with the current Focus 22 system used by many production companies because of its versatility.